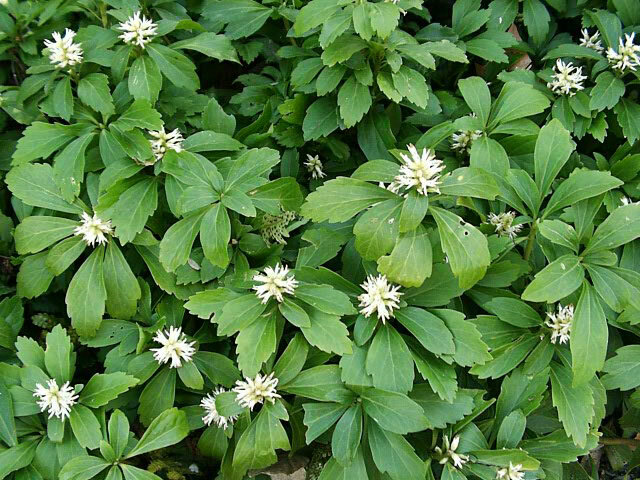 Pachysandra terminalis is commonly known both as Pachysandra and as Japanese Spurge. grow on thick, un branched stems to about 6" tall in partial shade and 10" in deep shade. Japanese Spurge forms a dense, dark green carpet of 3" leathery evergreen leaves with serrated edges. and in other areas where other plants refuse to grow. 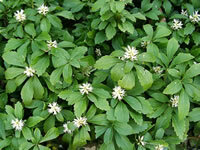 A variegated variety of Pachysandra terminalis is also available. tiny white flowers in late spring and summer. Pachysandra terminalis is hardy in USDA zones 4-7. Pachysandra should be grown in partial to full shade for the best results. Morning sun is fine, but too much sun will cause the foliage to bleach out, especially in the winter. of compost to the existing, well-drained soil and cultivating it in deeply. Test and adjust the soil acidity to maintain a pH of 5.5-6.5. Plant Pachysandras 12 inches apart and pinch back the tips occasionally for the fastest ground coverage. to establish a deep, strong root system. using a good, all-purpose, soluble fertilizer. Dig up and divide established clumps of Pachysandra. You can simply replant larger sections or pull them apart into individual shoots.